The light part of every 24 hours, presenting the work of Clare Jackson and Georgia Black showed at the Front Gallery + Café in Canberra from 26 August – 6th September 2014. Exploring the nature of perception and time, the name of the exhibition referred to the given definition of a day, or the daylight hours in which we are awake and most likely to experience the world around us. Curator Claire Capel-Stanley says, “Days imply time divided into consecutive slices, repeated unchanging. Despite the law of days our world is knowable only subjectively”. At first glance, the viewer unfamiliar with the artists may struggle to see the differences present between the two bodies of work. Both artists share a similar aesthetic sensibility; using soft lines, delicate shading and a muted colour palette rendered on paper using media such as graphite, watercolour and ink. 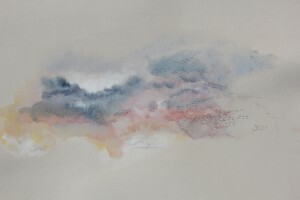 Both bodies have a sense of immediacy- Black’s depictions of clouds appear to be on the verge of changing, as clouds are wont to do, whereas Jackson’s work consists of both figurative and abstracted representations of moments, particularly as they relate to the imbued value of objects and created interiors. Jackson also presented small ceramic vessels and a beautiful series featuring three wooden stamps and the resulting imprints- an acknowledgment of process, which is important for both artists. The exhibition was drawn together with Hand me down, a collaborative drawing by Jackson and Black performed over the course of the week. John Berger’s seminal essay Drawn to That Moment (1976) explores the way that, when drawn, moments in time are perceived and depicted with inherent subjectivity. An object represented by the artist is not merely an object, but is seen and depicted through a specific lens. Objects, places and even less tangible notions of perception, such as light and darkness, may have an inherent, subjective value depending on the viewer. It is this attached emotion, memory or personal moment that many artists strive to communicate through their work. Embraced by the Impressionists in the late 1800’s, this phenomenological approach to art and mark-making can be seen throughout the 20th century- notably in the work of Picasso and the Cubists- and remains influential to contemporary artists working today. Both Black and Jackson approach their respective practices from this phenomenological perspective yet, as is the nature of experience and subjectivity, it is manifested in very different ways. Jackson’s work focuses on interior and domestic spaces and objects. The artist is interested in depicting particular moments in time that may be seemingly insignificant yet charged with emotion. This is manifest in two parts, the first is the creation of space- for example the way light can transform a room is seen by the artist to be highly evocative, stirring emotions and memories that contain with them a sense of nostalgia. Similarly objects can also be imbued with subjective meaning and experience, intrinsically attached by the perceiver to specific moments, people or places. In addition to her transportive drawings, Jackson’s ceramic vessels communicate a universally shared experience. Their soft, domestic forms and pastel colours suggest years of use, with all the memories and experiences attached. The vessels hark back to Jackson’s show earlier in the 2014, To Touch To Hold, that directly explored the association between objects and lived human experience. Whilst Jackson is predominantly concerned with the past, Black’s practice focuses on the present, depicting clouds as a way of exploring moments that are externally influenced, yet privately experienced. For Black, experience is informed by both external factors and internal perception that is both individual yet shared. The fact that clouds are created by millions of single droplets becomes a metaphor for each individual person within the vast mass of humanity. Black’s chief interest is not in depicting particular moments, but rather illuminating specific moments as part of a greater whole, perhaps even containing a certain sense of universality. The artist’s drawings glow with brilliant luminosity, light is captured for the way in which it illuminates the shimmering particles around it. Black also made use of other mediums in this exhibition, presenting Evidence of Dabbling, a video work that captures the fleeting shadows created by hand-crocheted items. Whilst not yet completely resolved, the work ties in effectively with her depictions of clouds and the flickering, ever-changing shadows presented are highly evocative in their own right. 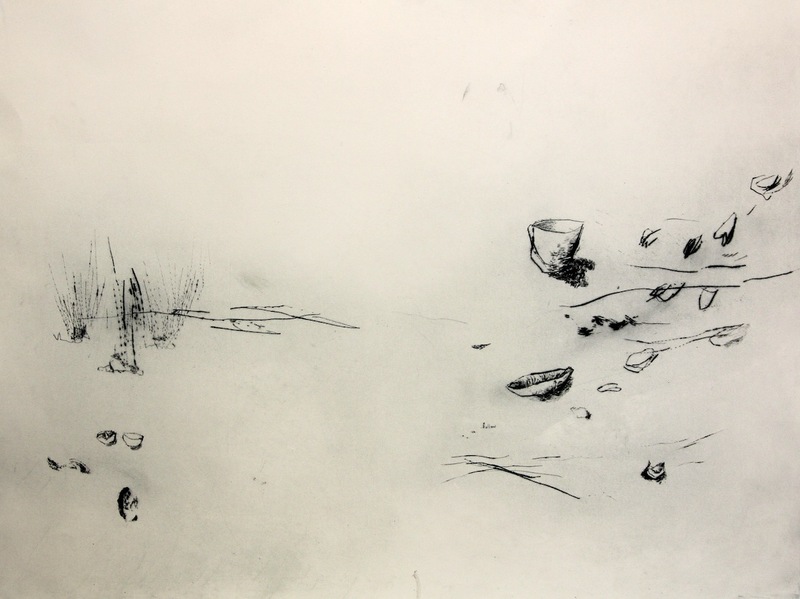 Like Jackson’s ceramic vessels, Evidence of Dabbling, complements Black’s drawing practice and it will be interesting to see whether the artist pursues the work further. The light part of 24 hours was a beautiful exhibition and featured work by two very talented artists. Both Jackson and Black are in the early stages of their careers and it are definitely artists to watch! 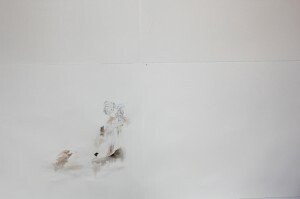 You can next see Jackson’s work at Honkytonks as part of their Greatest Hits exhibition, whilst Black’s next exhibition will be the Australian National University Art School’s Graduating Exhibition of 2014 where she will be presenting the culmination of her Honours investigations. Curator Claire Capel-Stanley is currently writer in residence at M16 Art Space. You can follow her blog or see the fantastic articles she has contributed to Lip here and here. This entry was posted in Art, Arts and tagged art, exhibition review. Bookmark the permalink.